The LNX-0500-M12-67 series Waterproof Ethernet Switch comes with 10/100MB LAN M12 ports, M12 4-pin D-coded, female connectors and auto MDI/MDI-X connections. The unit provides redundant power inputs of 12 to 48 VDC and is operated in -10° to 70°C temperature range. The switch can withstand large volumes of water and submersion for up to 1 minute. The unit’s 10/100MB LAN M12 ports offer 148,800 pps packet switching speed. BREA, CA – September 10, 2018 – Antaira Technologies is a global leading developer and manufacturer of industrial networking devices and communication solutions for harsh environment applications and is proud to announce the expansion of its industrial networking infrastructure family with the introduction of the LNX-0500-M12-67 series. Antaira’s LNX-0500-M12-67 M12 IP67 Layer 2 series switches have been designed specifically for harsh industrial environments. Our 5-year warranty guarantees reliable operation in applications that are subject to high vibration and shock. The redundant power inputs of 12 to 48VDC through an M12 5-pin A-coded male connector ensures availability and uptime. 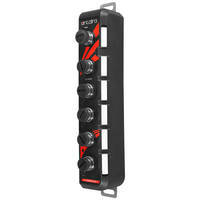 The IP67 rating signifies these switches can withstand large volumes of water and submersion for up to 1 minute. These switches feature a wide operating temperature of -10° to 70°C in the standard model and -40° to 75°C in the extended temperature model which allows this device to be used in extreme climates. The LNX-0500-M12-67 M12 IP67 Layer 2 series switches are also easy to manage. The 5 port 10/100MB LAN M12 ports offer 148,800pps for fast packet switching with store and forward technology. The M12 4-pin D-coded, female connectors feature auto negotiation speeds, full/half duplex mode, and auto MDI/MDI-X connections. For more details about Antaira Technologies’ industrial M12 Ethernet switches or other products, please feel free to visit www.antaira.com; or contact Antaira Technologies toll-free at 1-844-268-2472.